To view an interactive version of this map click here for desktop version and here for a mobile version. SOME patients in Northern Ireland are waiting up to nine months for a memory clinic appointment to confirm or rule out a diagnosis of dementia, The Detail can reveal. The findings also show considerable variation in waiting numbers, waiting times, and the type of memory service available in each of the five Health and Social Care Trusts. 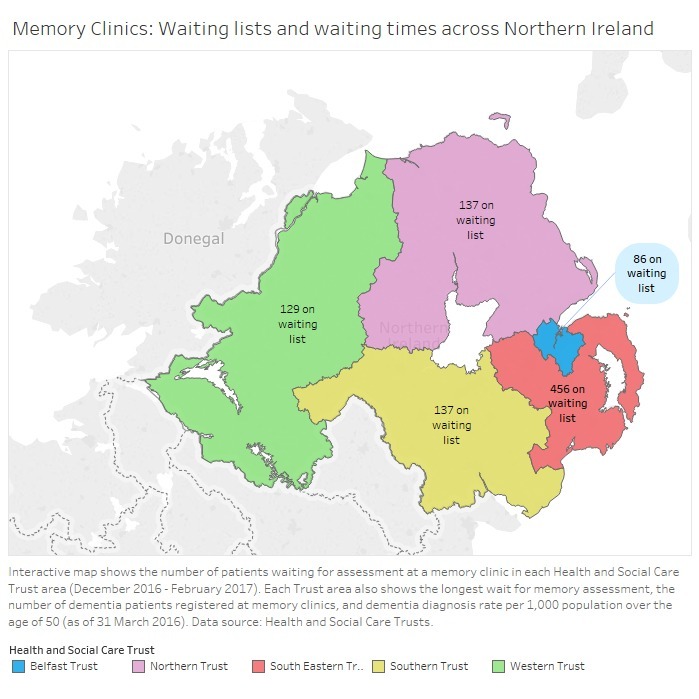 The figures secured under the Freedom of Information Act show that in early 2017 close to 1,000 patients across Northern Ireland were waiting for an appointment for assessment at a memory clinic. The South Eastern Trust had the highest waiting list numbers and the longest delays, with a sample of ten patients revealing waiting times of six months to more than nine months. Memory clinics are just one element of memory services provided by health and social care trusts – the main function of these clinics is specialist assessment and diagnosis of dementia. The Alzheimer’s Society in Northern Ireland said everyone has a right to a “swift diagnosis”, which is the gateway to further treatment and support. “These figures are obviously very concerning, and they reflect what our staff are seeing on the ground. 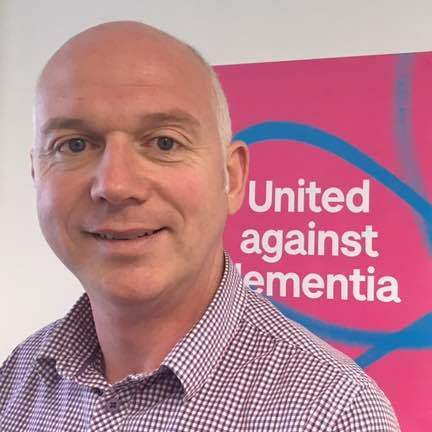 People are waiting much too long for a diagnosis of dementia,” Barry Smyth, Alzheimer’s Society Operations Manager for North and East Northern Ireland, said. A leading expert in the dementia field added that early assessment and diagnosis is key for patients and their families. Dr Peter Passmore, Professor of Ageing and Geriatric Medicine at Queen's University Belfast, said: “It depends on each situation but the theory would be to assess as early as possible, diagnose as early as possible, and treat as early as possible”. More than 13,000 people have a formal diagnosis of dementia in Northern Ireland but it is estimated that a further 7,000 people remain undiagnosed and untreated for the progressive disease. Loss of memory and cognitive function are hallmarks of the progressive disease, which affects the brain and is more common among people over the age of 65. Patients may be diagnosed by their GP or referred to specialist memory clinics for further assessment, tests, and scans to confirm the diagnosis or type of dementia, as two patients we spoke to were. This analysis reveals where pressure points exist in specialist services to assess and diagnose patients with memory problems. It found that of the almost 1,000 patients waiting for an appointment, some were waiting up to nine and a half months to be assessed at a memory clinic. The Health and Social Care Board, which oversees the health trusts, confirmed an “increased demand” for dementia services. This was, it said, in part due to changing demographics, an ageing population, and greater awareness - see here for statement from Board. The figures come as The Detail recently revealed that health and social care trusts were not meeting targets to increase diagnosis rates, as set out under the National Dementia Strategy – click here to read this story. They also come as the Department of Health is set to consider proposals to redesign memory services, prompting some concerns. Meanwhile we also reveal that patients in the Republic of Ireland face a postcode lottery and lengthy waiting lists for specialist memory services - click here to read this story. The South Eastern Health and Social Care Trust had the highest number of patients waiting for an appointment and also the longest waiting times across Northern Ireland, figures obtained by The Detail reveal. As of 12 January 2017 there were 456 patients waiting for an appointment for assessment at a memory clinic in the South Eastern Trust area. Of these patients, more than half were waiting for an appointment at Ards Community Hospital in Newtownards. The longest wait for an appointment in the Trust area was nine and a half months. Waiting times of between nine and 19 weeks were evident in other Trust areas over the various sample periods examined. Commenting on the figures, the South Eastern Trust said referral rates to Mental Health Services for Older People (MHSOP) were rising year on year, with around 160 new referrals every month. The Trust said pressure points were evident in the North Down and Ards areas, which have a higher ageing population and high number of nursing and care homes. The spokesperson added: “As demand outstrips capacity, the Trust has made MHSOP one of our reform priorities for 2017-19. We can assure the public that urgent referrals are prioritised and allocated an appropriate clinic appointment based on their clinical need”. See here for statement from South Eastern Trust. While accepting that memory clinic referrals across Northern Ireland are prioritised on a case by case basis, Professor Peter Passmore said any protracted delays in assessing and diagnosing dementia are of concern. “Supposing symptoms have been present for a year, that length of time wouldn’t be ideal if a patient has dementia because it leads to a delay in diagnosis and treatment. That would be too long,” Professor Passmore said. “That would mean that their dementia is not diagnosed or treated and that would be difficult for them and their family, who are worrying about what’s going on. If we diagnose Alzheimer’s disease we would want the patient on treatment as soon as we can. We wouldn’t want any unnecessary delays to treatment,” he continued. The Alzheimer Society expressed further concern that patients were not getting a “full diagnosis” in many cases. “Our dementia support workers and advocates are increasingly seeing people who have been told they have dementia, but not told what type of dementia it is,” Mr Smyth said. “People in Northern Ireland are being expected to wait months for a diagnosis, and even then aren’t being given a complete diagnosis. They aren’t being offered the tests needed to ensure that they have the most appropriate treatment, have information about their condition and how they can expect it to progress, or the information to make major decisions about their lives. This is simply not acceptable,” he added. Our analysis also showed variation in the type of memory clinic available and the number of patients registered across clinics in each health trust area. Some trusts operate dementia-specific memory clinics while others run combined clinics to meet the needs of patients with memory problems as well as patients with mental health issues. The lack of “dedicated” memory clinics across the health service, Professor Passmore said, may be a contributing factor to current waiting lists for assessment and diagnosis of dementia: “It could contribute to waiting lists if you’re mixing patients in with general mental health in combined clinics”. 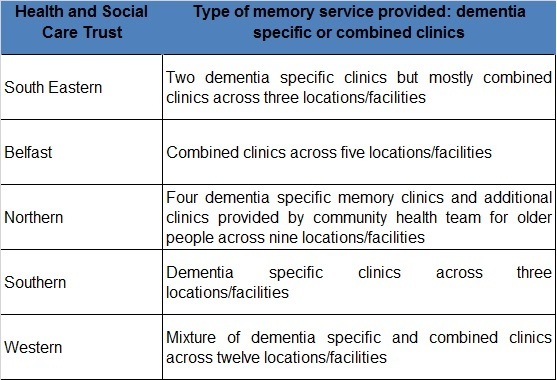 Figures provided by each Trust also suggest that between 60-99% of patients diagnosed with dementia (March 2016 data) are registered with memory clinics. The assessment and diagnosis process can be an anxious time for patients and delays can heighten that anxiety, according to members of Dementia NI, a patient advocacy and support network. Glenn McCabe from Bangor was diagnosed with vascular dementia a year ago. “I first noticed when I kept forgetting really obvious things like the name of my favourite football team and my family also began to notice when I’d forget things. That prompted me to see my GP,” Glenn explained. The 55-year-old was referred to mental health services for older people in the South Eastern Trust area for further tests but would have to wait some months to get confirmation of his diagnosis. “I was waiting a number of months for a brain scan and that was a worrying time for me. Until you get the hard evidence that you have dementia you’re denying it is happening to some extent,” Glenn said. Another patient who was concerned about his memory was Dudley Bartlett from Holywood. Last September he was referred to memory services in the Belfast Trust area, but felt that there was insufficient communication and explanation of what was involved, which he said made his initial assessment an “uncomfortable” experience. This also heightened his unease about what might follow: “It made me very nervous about going to my next appointment; I wouldn’t have been so frightened and upset only for that poor experience”. Dudley also faced the prospect of a five month wait for an MRI scan to confirm his diagnosis but rather than wait and add to further anxiety, the pensioner opted to go private and pay for the scan himself the following week. “I have since returned to the clinic for a check-up and had a very different experience where the doctor was very patient and took their time explaining everything to me,” Dudley added. New proposals, however, look set to change how dementia care and services, including memory clinics, will be provided in the future. The Dementia Strategy Implementation Group, spearheaded by the Health and Social Care Board and Public Health Agency, has developed a new model of care following a two year review of dementia services. The new care pathway is mooted to place greater emphasis on diagnosis and treatment by GPs in the community. Dr Passmore, a Professor of Ageing and Geriatric Medicine at Queen’s University, said any proposals to move dementia diagnosis to primary care represented “naive thinking” and could spell “disaster” unless there is adequate investment in training and resources. He said: “You’ll have an awful lot of people out there not diagnosed and a lot of people who don’t have dementia wrongly diagnosed; that’s what’s going to happen if this is not done properly”. The Alzheimer's Society said the proposed changes were likely to have cost and resource implications and could not be “an add-on to already busy GPs”. Its key priority is establishing a standard level of care so that patients in every trust area will have the same access to diagnostics and treatment. “Our major concern is that there must be consistency across Northern Ireland, starting with consistency in diagnosis,” Mr Smyth said. “Ideally we would want everyone to have access to an MRI, which is the most certain diagnostic tool. However, we know that some Trust areas now are using CT scans, while others are relying on the Mini Mental State Exam, a paper test that may indicate what symptoms of dementia you have but won’t physically show what areas of the brain are affected,” he added. Dementia services should also be “future-proofed” for any potential treatment breakthroughs for Alzheimer’s disease, according to Professor Passmore. “What happens if we get a treatment? We might not be light years away from that,” Professor Passmore said, adding that any treatment would likely involve secondary and specialist care. “They should be anticipating the possibility of a treatment. If and when we have a treatment I’m not sure GPs are going to want to or be in a position to provide the equivalent of chemotherapy for dementia patients,” he added. A spokesperson for the Health and Social Care Board said the new Dementia Care Pathway and Service Model was developed “to improve access to earlier intervention and improve integrated working between primary care and specialist dementia care teams”. “The new pathway and new services model was presented to the Department of Health in March 2017, and subject to ministerial approval and the required investment to support implementation, the new pathways will be implemented over a five year period,” they added. Click here to see a further story published by The Detail today on significant gaps in dementia services in the Republic of Ireland. A factsheet on assessing and diagnosing dementia, produced by the Alzheimer Society, is available here. Anyone concerned about their memory can call the National Dementia Helpline on 0300 222 1122 for further information.